Overlooking the breathtaking, snow-capped mountains of British Columbia, Canada, the Silver Star Mountain Resort is a gorgeous and scenic venue in Vernon, B.C. This location is equipped with a variety of areas designated to host both the ceremony and reception events. The vibrant village provides a magical backdrop for wedding photos to be taken. This ski resort is especially stunning during the winter months, when the trees are coated in white and the village is lit up for the holidays. Outdoor ceremonies are also an option at this glamorous venue, even throughout the winter. The Silver Star was especially beautiful on this couple's big day as the large, fluffy snowflakes were lightly falling from the sky. Although January is a chilly time of year, the couple was able to snuggle up to stay warm. It also helped that the bride accessorized her look with a fur shrug to cover her bare shoulders. This was a stylish and classy way to stay warm while still looking glamorous and fashionable. Wandering around the resort with the newlyweds, I was able to use the exterior of the building as a romantic backdrop onto the snowy scene. 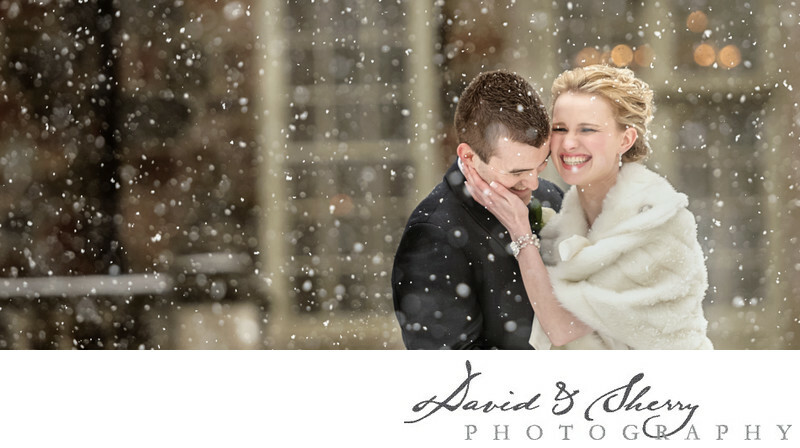 This is one of my favourite images captured from that day, because of the sheer happiness and smiles on both the bride and groom's faces as they stand beneath the falling snow. Silver Star Resort is located near Vernon, B.C. Location: 123 Shortt St, Silver Star Mountain, BC V1B 3M1..